The HK-150N Kit consists of a manually operated, hydraulically powered installation tool and inserts for a variety of Rivet Nuts. 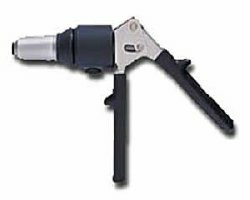 The HK-150 is a hydraulic tool designed to set from 1/8 Inch up to and including 1/4 Inch diameter steel, stainless steel, aluminum and plastic rivets by changing only the nose piece. The HK-150 has a rated pull pressure of over 3,500 lbs and one handed operation gives access to tight areas. The hydraulic system is sealed, oil cannot be added.